This is such an easy recipe ready within 30 min. Since we are using Chicken Breast it wouldn’t take long time to cook this dish. If you are in a hurry then this dish is perfect for you. Its also a great party snack. You can keep everything chopped and ready to go. And cook this chicken instantly. Heat mustard till smoking hot. Now add onions and cook till they turn soft. Now add your chicken strips and cook till translucent. Add salt & tandoori masala. Cook till chicken is soft. Lastly add the capsicum and cook for another 2 mins. Serve hot. This is an instant recipe. 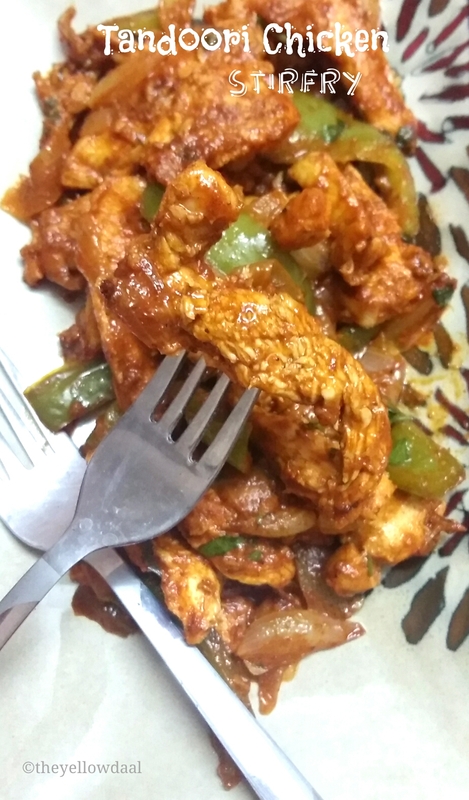 If you have time then you can marinade the chicken(on the bone will always be better) with some salt, kashmiri chilli powder, coriander powder, garam masala and ginger garlic paste. Leave it for 6 hours to overnight. Rest process remains the same. You can grill chicken on BBQ as well. Squeeze lime juice right before serving. If you like this recipe please like it and leave your valuable comments. You can follow my Facebook page to join me in my food journey.